The Indian herbal industry is estimated to have a turnover of Rs 2,300 crore annually. It is also involved in the export of finished products, intermediaries and bulk raw materials. More than 90 per cent of the plant species used by the industry are, however, collected from the wild of which 70 per cent involves unorganised harvesting that is invariably destructive. It is primarily plants in which the roots have medicinal properties that is most affected, says M P Sharma, plant taxonomist, Jamia Hamdard, New Delhi. "Plants which feature in the Union ministry of commerce list and are banned from export such as mamira , kutki , Nardostachys grandiflora (jatamansi) and Podophyllum hexandrum (ban kakri) are scarce," he says. Suresh Chaturvedi, a vaidya (traditional physician) from Mumbai and recipient of the Padmashree award, and M B Akkalkotkar of the Ayurveda Research Institute, Pune, add to the list some tree species such as Saraca indica (ashoka), Commiphora mukul (guggulu) and Symplococos racemosa (lodhra). One way of assessing the shortage is the ever-increasing prices. For instance, one kilogramme of A heterophyllum or ativisha has gone up from Rs 200 per kg to more than Rs 2,000 per kg in the last 15 years, says P K Warrier, chief physician, Arya Vaidya Sala, Kottakkal, Kerala. This kind of price rise cannot be attributed to increase in demand alone. "Simply put, all the plants needed for ayurveda are in short supply," summarises vaidya Nagendra Nath Dixit of Lucknow. "While rich vaidyas can afford to buy herbs at higher prices, the poor ones who are catering to the poor community are unable to do so," says Balendu Prakash, a practicing ayurvedic physician and director of vcpcrf. The basic philosophy of ayurveda that health care should be available to all is lost. It is estimated that there are some 600,000 registered practitioners in the country today. Add to that the 95 approved and 45 temporarily approved ayurveda and 31 Unani colleges churning out thousands of new practitioners every year. If the plunder of the forests to fill the coffers of a few is to continue, the plight of the practitioners can well be left to imagination. According to N Singh, director, International Institute of Herbal Medicines, Lucknow, who is also engaged in cultivation of some plants like brahmi (Bacopa monnieri) and ashwagandha (Withania somnifera), the raw material available in the market is "manure". 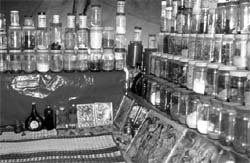 The shortage has induced collectors to use adulterants. Moreover, in many cases the collectors -- who are employed as casual labourers -- have very little idea of the medicinal plants. They not only devastate the ecology, but also do a lot of "mixing" unconsciously because of their lack of knowledge about medicinal plants. Vaidyas who in earlier times used to set out to the forests themselves to collect the plants do not do so anymore. The plants are no longer found in accessible areas. The raw materials can also lose their potency during the time it is transported from one place to another. "Due to unavailability of some plants in Kerala, we have to be get them from Tamil Nadu," says Warrier. Lack of proper storage facilities on the route along with lack of knowledge of preservation techniques does no good to the final product. But not many manufacturers, especially big firms that use medicinal plants in their concoctions, are bothered about the quality of the raw materials. In any case, protocols for testing the quality of finished products are non-existent. According to Mohammad Iqbal, head, department of botany, Jamia Hamdard, "Sometimes microorganisms like fungi can grow on the material and make the herb toxic." One of the best-known ayurvedic concoctions, chyavanprash is widely favoured for enhancing the human body's immunity system. It comprises 70 ingredients, but 85 per cent of it is amla (Embilica officinalis). But, according to Meenakshi Sharma, an ayurvedic physician based in Delhi, India is not producing enough amla needed to prepare the amount of chyavanprash available in the market. "What the manufacturers are doing is using sweet potato instead. This reduces the efficacy of the product," she says. "In fact, the chyavanprash that is available today tastes sweet and not bitter," she adds. "Honey is substituted by sugar. This can be harmful to diabetics and those suffering from high cholestrol levels," says Balendu Prakash. Shortage of medicinal plants is further aggravated by the export of raw materials. Because of quality controls, buyers from developed countries do not accept finished products from India. Hence, the only alternative is to sell raw materials, once again short-term profit motives destroy long-term benefits. Sumeet Rai of Maharishi Herbals, New Delhi, who exports botanical and medicinal herbs, agrees that he chooses the best materials available for export. "Generally, Indian companies do not buy the materials at the same price," he says. traffic -India points out that a very high percentage of threatened medicinal plants as assessed in the exercise may not reflect the actual position for all medicinal plants in India because the 75 taxa assessed represent better studied plants, which may have been selected by experts due to concern over their conservation, not necessarily over concern for ism. Nevertheless, traffic- India compiled a list of 471 plants important to ism and modern medicine and a list of 226 threatened medicinal plants according to various status assessment exercises undertaken in India. Comparing these two lists revealed that 51 medicinal plants are vital to ism, but they are threatened. Following the iucn pattern, the Botanical Survey of India, Calcutta, brings out the Red Data Book of Indian Plants that classifies plants into six categories -- extinct, endangered, vulnerable, rare, insufficiently known and out of danger. The last category includes plants that had earlier belonged to either one of the first five categories, but have become sufficiently available overtime. Due to insufficient data on the use of medicinal plants for domestic trade, it is very difficult to say which of the plants are most used. Preferring to keep their trade a secret, manufacturers and practitioners are also tight-lipped on the species they use. A report prepared by the Planning Commission's taskforce on conservation and sustainable use of medicinal plants lists 25 most used plants in ism . Led by D N Tewari, the taskforce report includes four critically endangered (ativisha, jatamansi, Swertia chirata and kuth); two endangered (Berberis aristata, kutki) and one vulnerable (gurmar)species according to the bccp list. Natural Remedies Private Limited, a Bangalore-based company manufacturing herbal extracts, alone lists 13 plant/herb species which are needed in quantities more than 50,000 kg per year, while a study of the medicinal plants requirement of Kerala in 1995 lists 10 species which are needed in quantities more than one million kg a year. These are only a few examples of the requirement of medicinal plants and herbs manufacturers of herbal products face -- an indicator of how much herbs and plants are required by the industry. Comparing Tewari's list with that of Natural Remedies and Kerala's, one can easily see that the former does not include many plants, which are required in large quantities. Garcinia indica (kokum) and Aegle marmelos are the only species that find a mention in the Planning Commission list. Besides, most of the species listed by Natural Remedies are tree species, which are in short supply, while the Planning Commission's focus is on annuals and biennials (see table: Plants in demand).